Thanks to Ted Robbins for theatre sofa! 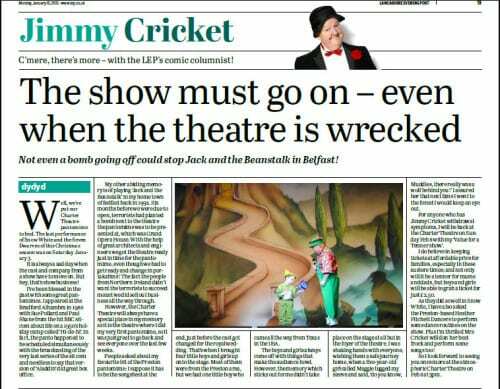 Jimmy Cricket talked in his latest newspaper column about how a gift to a theatre from an old friend helped him to relax in between panto performances during the festive season. 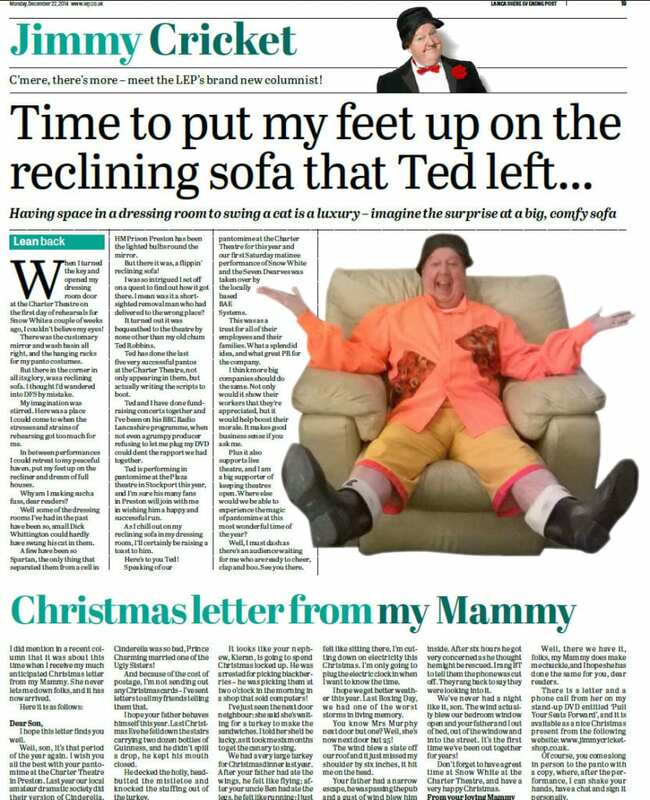 The famous Irish comedian said that when he first arrived at the Charter Theatre in Preston for Snow White and the Seven Dwarfs, he noticed a reclining sofa in his dressing room. And he told readers in his most recent Lancashire Evening Post monthly column that he discovered it had been bequeathed by fellow entertainer and old chum Ted Robbins. Jimmy also describes how BAE Systems employees and their families took over the first Saturday matinee performance of the pantomime. He included a Christmas letter from his Mammy in his column, in which she talked about who gets what on the festive turkey and a nephew being arrested for picking blackberries in a computer shop. 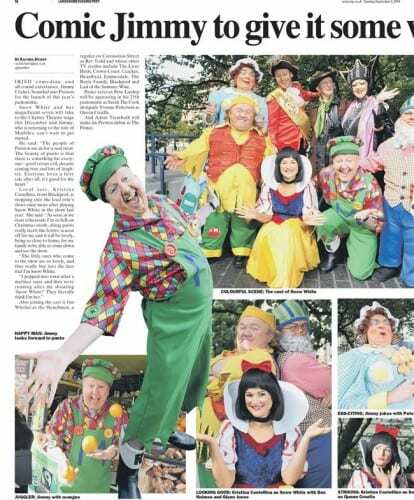 Jimmy Cricket’s latest pantomime received great coverage at its recent media launch. The famous Northern Irish entertainer will be appearing in Snow White and the Seven Dwarfs at the Charter Theatre in Preston – where he made his panto debut in 1981 – over the Christmas and New Year period. Back then, the Rochdale-based funnyman figured in a version of a contemporary pantomime called Robinson Crusoe in Outer Space when he was described as “Britain’s fastest rising TV comedian”. 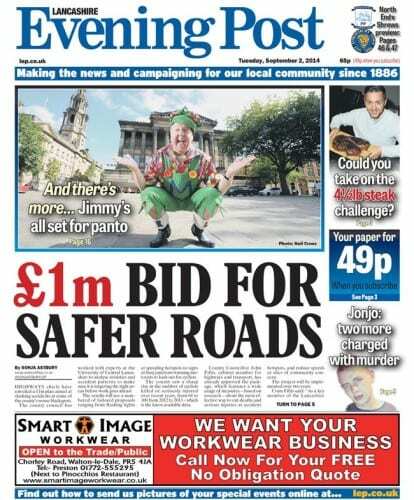 Ahead of his 27th pantomime season, Jimmy had top billing (above right) on the front page of the 2 September edition of the Preston-based Lancashire Evening Post. Inside the newspaper was a two-page spread (left) featuring photographs of all the cast who had assembled for the media launch. On his arrival in Preston, he will be reunited with the creative team who produced last Christmas’s record -breaking version of Snow White at the Forum Theatre in Billingham, with some of the cast having also been retained. Jimmy said: “With the nights drawing in and the leaves starting to turn golden, it won’t be long before it is panto time again. 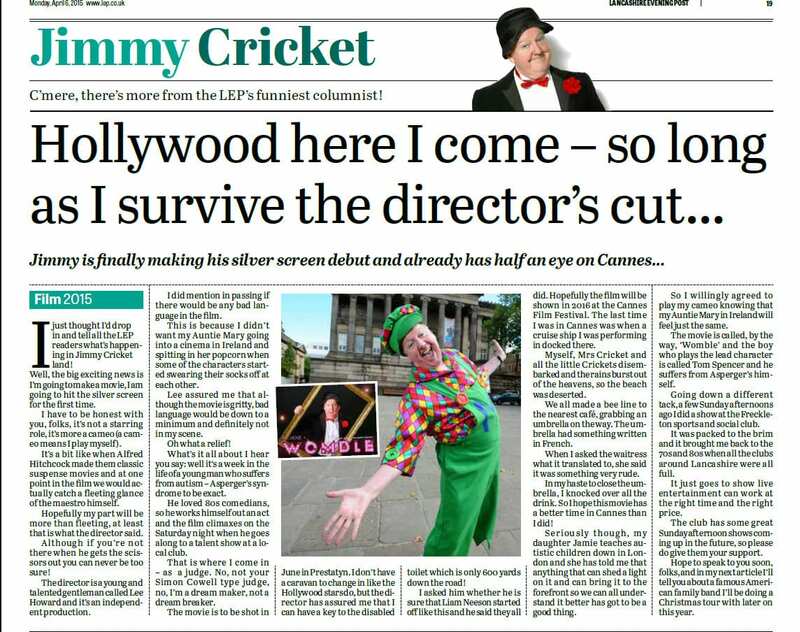 * Jimmy is writing a monthly column for the Lancashire Evening Post in the lead-up to Snow White and the Seven Dwarfs at the Charter Theatre in Preston. Jimmy Cricket is to write a monthly newspaper column in the lead-up to his latest pantomime season. The Lancashire Evening Post has commissioned the articles to coincide with the well-known comedian headlining Snow White and the Seven Dwarves at the Charter Theatre in Preston – where he made his panto debut in 1981 – over the Christmas and New Year period. 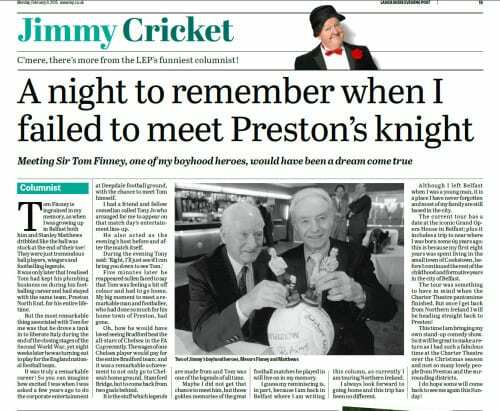 When the Lancashire Evening Post contacted Jimmy through his website editor Martin Hamer – former digital editor at the LEP – about the idea, he thought it was a “very flattering request”. He intends to use the article to describe some of the many stories he has collected from more than 30 years of performing in pantomimes. This includes appearing in many of the major cities and towns across the UK and has also included working with a variety of celebrities from stage and screen. Jimmy Cricket will be performing in pantomime later this year at the Charter Theatre in Preston – where he made his panto debut in 1981. 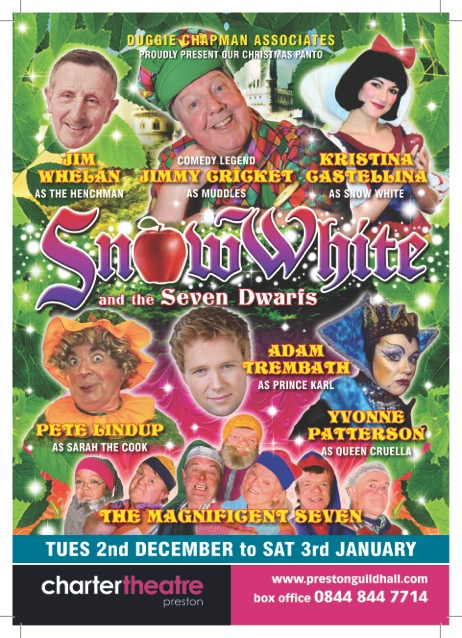 The famous entertainer will be appearing in Snow White and the Seven Dwarves (poster below) at the Lancashire venue. 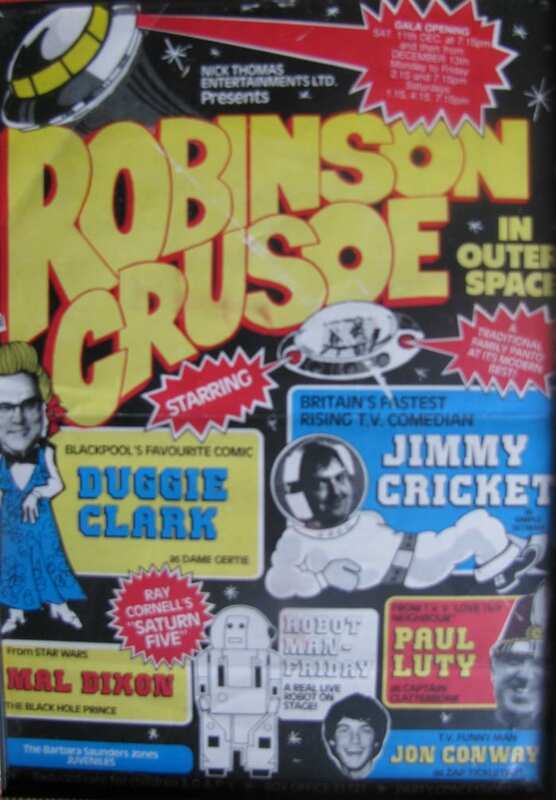 It will be 33 years after the Northern Irish funnyman figured in a version of a contemporary pantomime called Robinson Crusoe in Outer Space (left) when he was described as “Britain’s fastest rising TV comedian”. Belfast, Glasgow, Nottingham, Bradford, Oxford, Birmingham, Manchester, Liverpool, Darlington, Billingham, Wolverhampton, Truro, Doncaster, Lichfield, Swindon, Torquay, Southport, Ashton-under-Lyme and Weston-Super-Mare. On his arrival in Preston, he will be reunited with the creative team who produced last Christmas’s record -breaking version of Snow White at the Forum Theatre in Billingham. 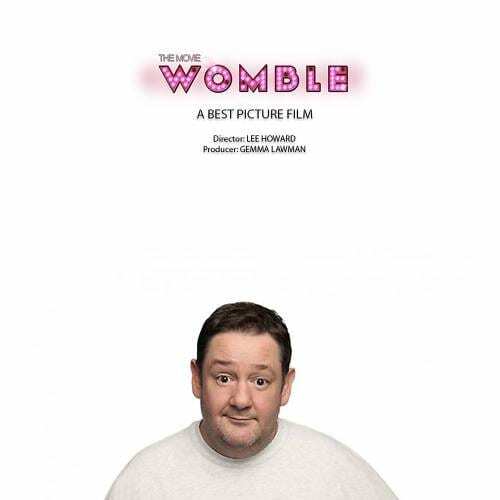 Some of the cast have been retained for the Preston version, which has delighted Jimmy who is looking forward to a happy return to the Charter Theatre. 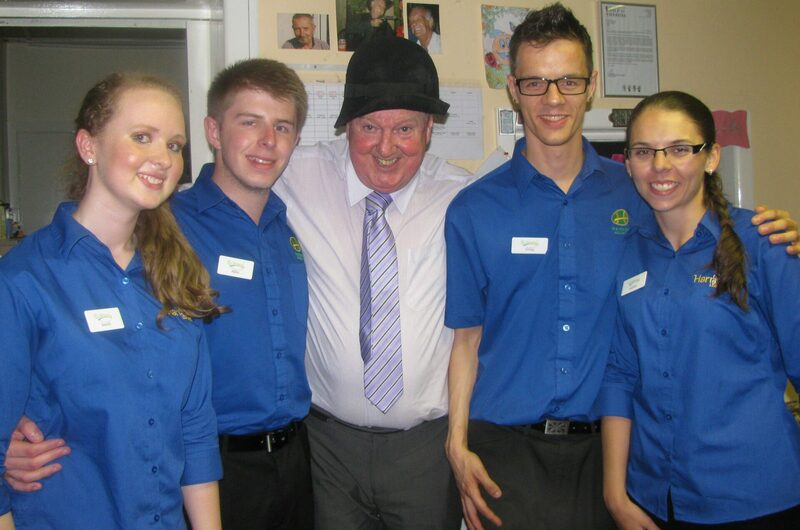 A holiday village in Southport was a recent port of call for top entertainer Jimmy Cricket. 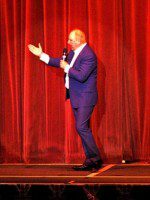 The Irish comedian headlined a show at the Riverside Holiday Park at the start of July, appearing with the village’s resident company at its main cabaret venue. The Riverside is owned and run by a family-run company called Harrison Holidays. It owns three other holiday park locations , including another in the Southport area, plus one near Preston and one in Cumbria. Irish comedian Jimmy Cricket got into the Olympic spirit when he compered a dance spectacular celebrating the forthcoming London Games. The famous funnyman was asked to front up the special show which marked the Olympic Torch coming to Southport ahead of London 2012. It was staged at the Southport Theatre and organised by the Liverpool-based Allied Dancing Association Limited. Former Olympic gold medallist Dame Mary Elizabeth Peters was a special guest at the event. 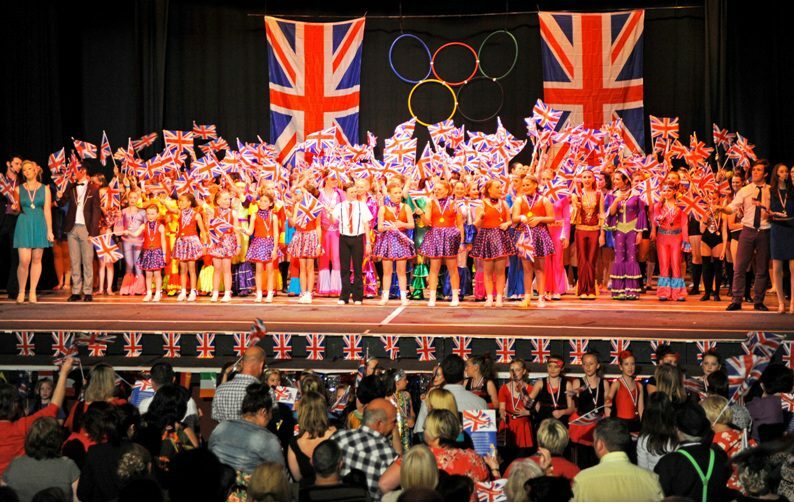 The 19 dance schools which took part in the show were: Garswood School of Dance, Vibe Stage Academy, The Stage School, Harlequin Dance Club, Formby School of Dance, Dance Flava, Claire Knight School of Dance, Martins Dance Centre, Excelsior School of Dance, Phoenix School of Dance, Dance Depot, Liverpool Theatre School, Felicia Burns School of Dance, Chriska Stage School, Marshside School of Dance, Southport School of Dance, Crown Dance School, Jade School of Dance and Dance Passion. The general secretary of Allied Dancing Association, Carol Parry, invited Jimmy to host the show. They first met last Christmas during Jimmy’s pantomime season at the Civic Theatre in Darlington. Carol’s daughter, Melissa, featured in the Southport Theatre show as a dancer. Jimmy says: “This was a spectacular show and my hats off to all the organisers of this event for all the hard work they put into it.